In September of that year, General Douglas MacArthur had pulled off a brilliant and major blow to the North Koreans with the invasion at Inchon that resulted in recapturing the capitol city of Seoul and drove the North Korean People’s Army (NKPA) above the 38th parallel, the latitude line that separates North and South Korea. Buffeted by a string of victories and destruction of the NKPA, U.N. allied intelligence believed the end of the war was close at hand. Despite Chinese warnings to the United Nations and even skirmishes in the north with Chinese forces, most did not believe that the Chinese would enter the war on a full-scale basis. Some historians believe that MacArthur’s motivations were to squash that notion by showing superior strength in battle, end the war and re-unify Korea by Christmas. U.N. troops rapidly advanced deep into North Korea. The Chinese had different ideas. In mid October, massive amounts of CPVA troops began to secretly cross the Yalu River on the Manchurian border into North Korea. They would camouflage by day and advance by night, undetected by U.N. intelligence. Roughly 120,000 Chinese forces would surround the Chosin Reservoir area now secured by 30,000 U.N. forces. On November 14, a third enemy would arrive. A bitter Siberian cold front, not seen for a hundred years, blew into the Changjin Valley and drove temperatures into the sub-30 degree range. Equipment, vehicle, weapons and medical supply malfunction’s were rampant. Frostbite, icy roads and now the frozen, rough terrain were serious combatants as well… for both sides. The attack began on the night of November 27th, four days after Thanksgiving. U.S. and allied troops were surprised by the sounds of whistles and bugles as the Chinese Army attacked in waves from every angle. The U.N. forces were surrounded. Realizing that their forces were vastly out numbered, the “pull back” and order was given and a hastily made plan for retreat was formed that U.S. Historians would later call, “the greatest evacuation made at sea in U.S. military history.” However, it was no easy feat as the order from Chairman Mao to his military commanders was to not just drive the enemy back below the 38th parallel, but annihilate the U.N. forces. There are many stories of intense fighting, bravery and heartache from the battle. To include them all in respectful detail would take volumes of books, and indeed these books do exist. However, to get an understanding of the battle from a visual and visceral sense, there are two gripping documentaries. The first, “Chosin” by Brian Iglesias, a former Marine who served in Iraq and the second via PBS: American Experience called, “The Battle Of Chosin”. Yet an honorable mention should be made to the legendary courage of the USMC for their grit and determination during the battle. The 1st Marine Division, out of Camp Pendleton, California, dubbed “the old breed”, was part of the X Corps made up of Army and USMC forces that were travelling north up the eastern coast headed to the Chinese border at the Yalu River. These particular U.S. Marines fought for survival. Surrounded and outnumbered 8-to-1 by Chinese forces, the Marines scratched and clawed their way on a 78-mile journey to the Sea of Japan to reconnect with American forces. The trek would take 13 days. USMC training of “everyman a fighting man” would prove invaluable. Cut off from support, the Marines were still able to fight their way through 10 Chinese infantry divisions and the twisting, icy, bottleneck escape route. The courage shown by the Marines at the Chosin Reservoir was another example of their resolve to fight against impossible odds. 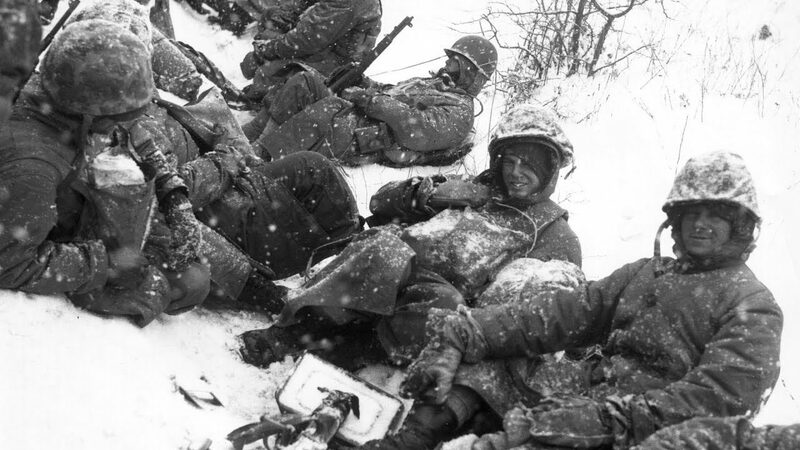 The attitude of those who served at the “frozen Chosin” set an example that is still remembered by Marines and sailors both young and old. Casualties for the U.N. Forces were 4,385 U.S. Marines, 3,163 Army, 2,812 Republic of South Korea and 78 Royal British Marines. Another 7,338 U.N Forces perished from the cold. For the Chinese and North Koreans, actual numbers are difficult to verify. “Official” Chinese sources claim a rough 48,156 as killed-in-action, but outside sources, taking into account the Chinese reinforcement flow and the aftermath of the battle somewhere between 40,000-80,000 dead from combat and the cold weather. In fact, Mao’s largest fighting force, the 9th Army was so decimated after the Chosin campaign, they would not be battle ready again until March of 1951. This article was made possible by American Veterans Aid; a private company that specializes in consulting war-era veterans and their spouses on long-term care planning and the Aid & Attendance benefit. The Aid and Attendance benefit is a tax-free reimbursement for care, including home care, assisted living, adult day care, board and care and skilled nursing care. To qualify for the benefit, the veteran must need help with some of the activities of daily living, such as bathing, dressing, eating, toileting and transferring. Benefit amounts can vary depending on whether the veteran is married or single, and how much the veteran is spending on care. Spouses and surviving spouses can also receive the Aid and Attendance benefit to help pay for long-term care. A surviving spouse must have been married to the veteran at the time of his passing and never remarried. To find out more about the VA Aid and Attendance benefit, contact an AVA benefit consultant today at (877) 427-8065 or register to see if you qualify.